The Duke and Duchess of Cambridge braved the weather to make their debut appearance at Royal Windsor. It was the first time the Duchess had visited Royal Ascot - a key date in the racing and social calendar. She wore a beige Dolce and Gabbana dress and Jane Taylor hat. The crowd cheered as the procession of the Royal Family, led the Queen and the Duke of Edinburgh in the first carriage, pulled into the parade ring. Light Music - the Queen's horse - failed to win, but she does have two more horses competing in the last race of the day on Wednesday. The 90-year-old monarch, wore a cyclamen pink outfit by Stewart Parvin with a hat by Angela Kelly. 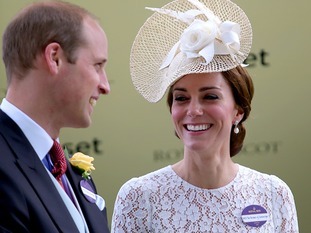 It was feared the weather would dampen spirits, but William and Kate ditched the umbrellas during an untimely downpour. Kate also surprised racegoers by joining William to present the Duke of Cambridge Stakes trophy to the owner of Usherette - the winning horse - to Mohammed bin Rashid Al Maktoum. The Duchess was not expected to be assist in awarding the trophy, but entered the parade ring with her husband to cheers and clapping.